NThe latest update to SteamVR adds asynchronous reprojection for Nvidia GPUs. Similar to Oculus’ asynchronous timewarp, it mitigates unwanted ‘judder’ when the hardware fails to maintain 90fps. 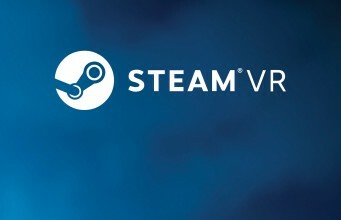 Available via the SteamVR Beta since October 25th, asynchronous reprojection is a much-awaited feature, particularly for HTC Vive users. The idea is to maintain smooth motion on head orientation when the framerate drops below 90fps. Previously, Valve’s universally-compatible solution was ‘interleaved reprojection’, which capped the rendering at 45fps, reprojecting every other frame to make head rotation still ‘feel’ like 90Hz, but having a negative impact on positional movement and animation. With asynchronous reprojection, a slight drop in performance will not trigger this halving of framerate, instead picking up the previous frame and displaying it again, shifted to match the updated orientation data. The overall result is a major improvement to smoothness and comfort, as situations where framerate is fluctuating just below 90fps are very common. Oculus Rift owners have been enjoying the benefits of an asynchronous reprojection solution (called asynchronous timewarp) since its launch in March, which already works across all applications (including when using the Rift in SteamVR mode), so there is no impact on Rift users with this update. It’s great to see Valve beginning to offer a similar technology, but they still need to expand the support to AMD cards in order to match Oculus’ complete solution. Oculus Touts New VR Rendering Feature, Valve Calls It an "Ideal Safety Net"
Valve has been somewhat reluctant to enable more advanced reprojection solutions, having prioritised ‘adaptive quality’ (e.g. dynamically adjusting resolution and anti-aliasing) to hold framerate, as this caters to a wider range of hardware and other operating systems. Oculus, on the other hand, are Windows only, and have gone a step further in performance mitigation, having recently introduced ‘Asynchronous Spacewarp’, which deals with positional and animation judder that is still apparent with conventional asynchronous reprojection. This has effectively reduced the minimum requirements for VR rendering, as the Rift now works comfortably at 45fps. We can expect to see a form of ‘spacewarp’ from Valve too, as it is not only an effective safety net for performance drops, but it is also important to reduce the cost of entry to VR in general. The post SteamVR Update Adds Asynchronous Reprojection appeared first on Road to VR.